The UltraLink is easy to install and configure. Connect the unit, assign an IP address, install the remote viewer software, and it's ready to use. The sophisticated scaling feature allows you to position any size image of your server's video anywhere on your screen. With this feature, you can monitor servers while working on other tasks in another window. 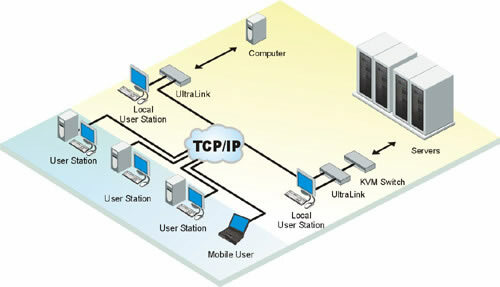 Network workstations can connect to multiple UltraLinks and display each connection in a separate viewer window. The dual access IP KVM model contains two completely independent units in a rack mountable chassis. Typically, the dual and quad models are connected to a KVM switch. This provides multiple users remote access to the servers.